Allen College and the Allen Foundation thank everyone who supported the first ever Allen College Day of Giving which took place in August 2018. Thanks to many generous donors, the $50,000 gift that was made by Class of 1962 alum Ginny McBride and her husband Mike in honor of Dr. Jerry Durham's retirement from Allen College was matched! 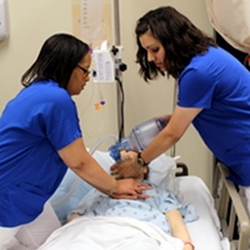 Securing this match allows Allen College to acquire another state-of-the-art simulation manikin to better provide experiences for students in a risk-free environment. In total, nearly $28,000 was raised on the Day of Giving and there were over 90 donors. Together, we are growing the simulation program at Allen College and continue to prepare exceptional healthcare students. Our donors make a difference! Young Alumni Challenge was met! Power Hour Challenge was met! Thank you for going #allinforallen! If you would like to learn more about supporting Allen College or are interested in taking a tour of the simulation lab, contact Beth.Sullivan@unitypoint.org or call (319) 226-2016. To make an online donation today, please visit the Foundation website.